Amazon in top spot in both 2017 and 2018, but otherwise the top 10 is dominated by traditional B&M brands. The huge growth in impressions (and spend, of course) has happened in parallel with just an 8% increase in the number of advertisers, which means that advertisers are spending a LOT more of their budgets to get their message out to their target audiences. 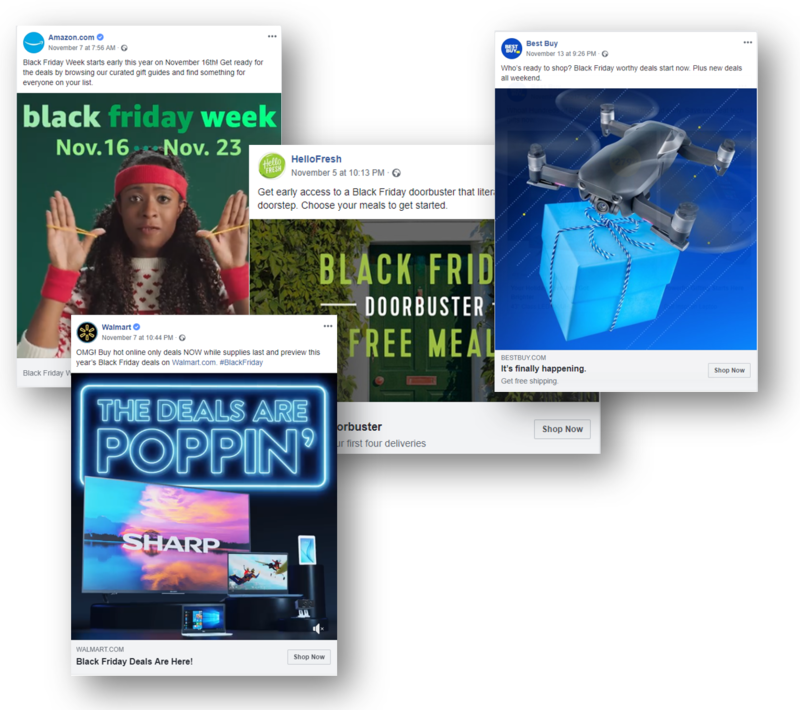 Use of Facebook to promote Black Friday has grown significantly in the past year. So which brands are spreading their message via Facebook? Not surprisingly, the #1 advertiser in terms of share of voice (i.e. overall number of impressions) both this year and last year is… drum roll please… Amazon. However their share of voice dropped from a massive 21% in 2017 to “just” 8% in 2018 (still huge, considering how many posts they are competing with). 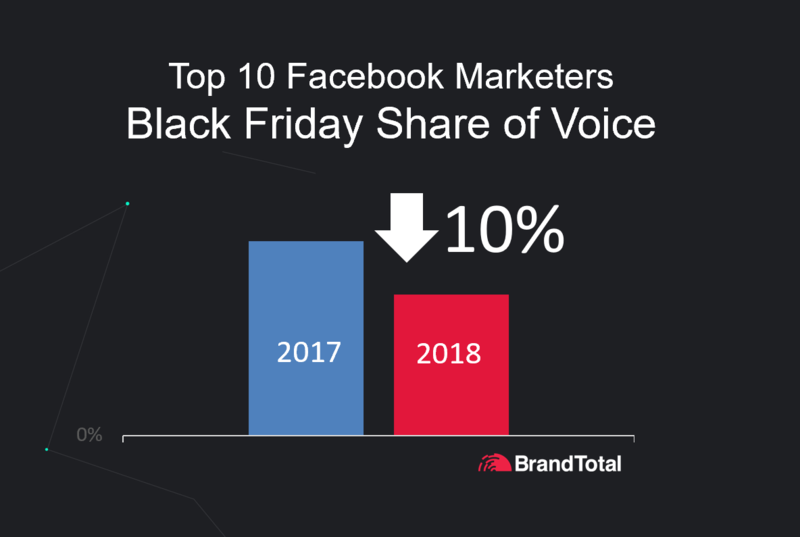 The #2 spot in 2017, Walmart, with 6% share of voice, dropped to 8th place in 2018, with a mere 2% share of voice. The #2 spot this year is held by Digital Native HelloFresh, with 4% share of voice, after not appearing at all in the top ten for 2017. I guess after all that Thanksgiving cooking they figure people will want to start ordering meal kits. The e-commerce coupon enabler Honey doubled down on its share of voice from 1% in 2017 to 2% in 2018, going from 7th place in 2017 up to 5th in 2018. 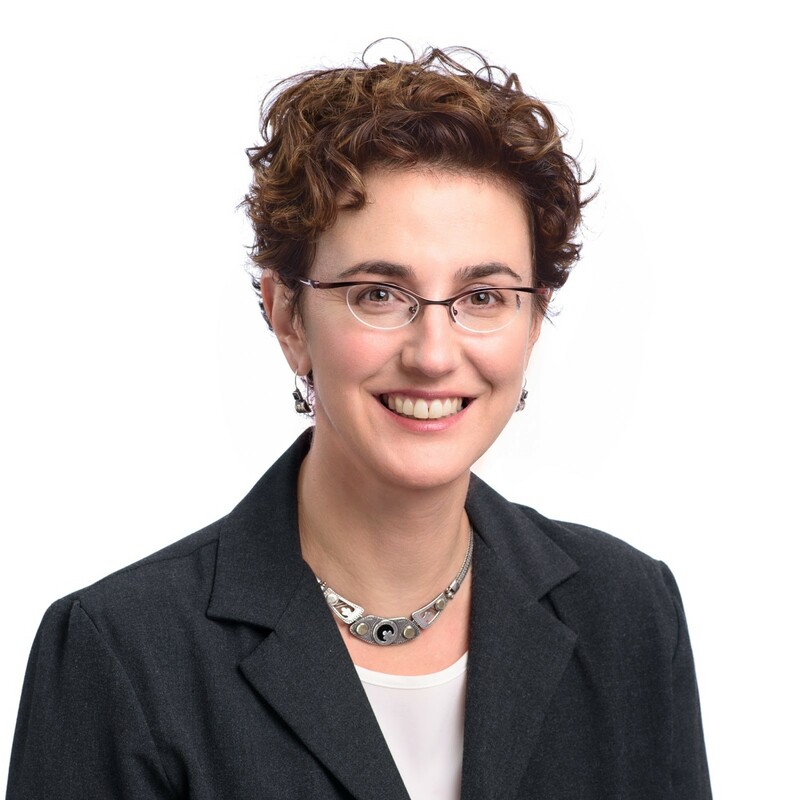 Some of the companies that appeared in the top 10 last year but dropped off this year include Nissan, jewelry designer Lisa Leonard Designs and Macy’s. Newcomers to the top 10 include: The Home Depot, and Xbox, each with 2% share of voice and Shutterfly with 1%. 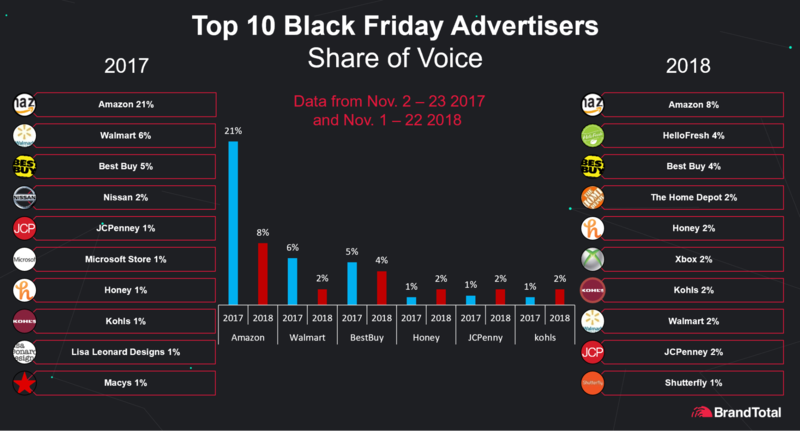 Both JC Penney and Kohl’s appear in the top 10 for both years, with 2% each share of voice in 2018, with Kohl’s at #7 and JCPenney at #9. 1) Make sure your campaigns stick out from the crowd. With so many companies marketing their offerings on Facebook and share of voice dropping, you need to make sure your campaigns are eye catching, especially for YOUR target audience. 2) Focus your efforts on your target audience. No need to waste budget and effort on people who are not in your defined audience, as chances are you will be competing against lots of other brands you hadn't even considered. Put your best foot forward for your specific audience and you'll get the best results for your investment. 3) Consider branching out to other channels. Facebook isn't the only place your people are hanging out. Depending on your brand and audience, you should consider Instagram, YouTube, Twitter, Amazon and display ads, and compare the results to ensure you are leveraging your budget to its maximum. 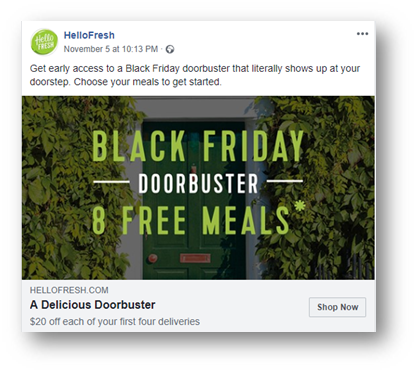 Incidentally, we chose to focus on Facebook for this post since it’s one of the leading channels for Black Friday campaigns, but let us know if you’re interested in a similar analysis of another social channel - we’ll be happy to explore that in another blog post.